Many, if not the majority, of human diseases are what are called zoonotic. They don’t originate in humans but pass to humans from animals. Ebola, the common flu (“…wild aquatic birds are now known to be the ultimate origin of all influenzas…“), and AIDS are just a few examples. It seems that the rate at which such diseases are making their way to the human population is increasing. In his book Spillover, David Quammen delves deep into this question, traveling the globe, interviewing leading scientists, and witnessing first-hand our response to these diseases. Spillover is one of those “popular” science books that it would behoove everyone to read. It is accessible, boiling the science down to the essentials and describing it in a way that is understandable. More importantly, it discusses a topic that is often in the news and which will only become more prevalent and newsworthy as time passes. Further, the types of diseases that Quammen investigates are becoming more common and understanding why and how may be a critical step in preventing a future epidemic. This is one of those books where I was constantly highlighting passages, as I was continually learning something new, interesting, and, seemingly, important. Quammen is a field reporter, having worked with publications such as National Geographic. He doesn’t just report but he participates in his stories. As such, he has a multitude of anecdotes to share. Some of them are very enlightening as he describes, for example, how he helped capture bats to test them for various viruses. Once or twice, his penchant for storytelling goes a little astray, for instance when he hypothesizes the voyage of one of the first HIV positive men in Africa traveling along the river and settling in a city where he spreads the disease. In these instances, I grew a bit impatient and wished he would get to the science. But, overall, his vibrant descriptions broke up what might have been a dull narrative and certainly gives it flavor. Quammen describes the basics of zoonotic diseases. They have some animal host, that often is unaffected by the pathogen. Often there is an amplifier host, another animal in which the virus can quickly replica and from which it can be quickly injected into the environment and find its way to humans. He goes in to detail about numerous zoonotic outbreaks and how scientists trace the origins of those outbreaks and try to develop vaccines for them. This effort reads like a detective mystery, as scientists have to piece together very fragmentary bits of evidence to build a picture of what is going on. And this is a hard problem. We still don’t know what the host animal is for the Ebola virus, despite the effort put into identifying it. 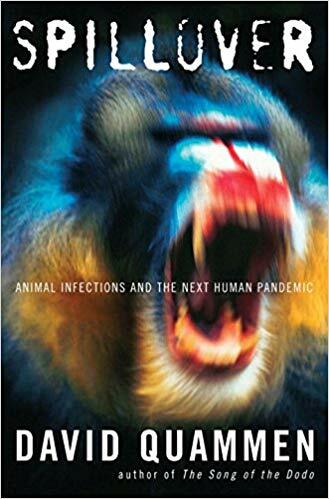 One of the central themes of Quammen’s book, one that he raises multiple times but doesn’t really beat to death, is that the reason that zoonotic diseases are on the rise is because humans are continuously disrupting the habitat of animals. By deforestation and construction, we encroach into new areas where animal hosts with these diseases have lived maybe for millennia and now we are exposed to them and their diseases. It is our increased interaction with remote species that seems to be the driver. As Quammen puts it “Human-caused ecological pressures and disruptions are bringing animal pathogens ever more into contact with human populations, while human technology and behavior are spreading those pathogens ever more widely and quickly.” By the latter, he means our ease of global travel, where a virus originating in China can make its way through Hong Kong and then to Europe and the Americas before anyone comes down with symptoms. There are also a lot more of us than there used to be. From the planet’s point of view, we might be one of the more successful pathogens… As Quammen summarizes the situation “Ebola virus is not in your habitat. You are in its.” Further, climate change may exacerbate the problem. Drier climates can lead to easier transmission of pathogens as they can carry on the air easier. Often, the host species are bats. This surprised me to some degree. Why would bats be special? This is a question that is still being understood. Bats are very abundant. One quarter of all mammal species on the planet are bats. They also behave very differently from other mammals in that they can fly long distances and roost together in large communities, enabling the transmission of pathogens. However, the role of bats as hosts seems greater than their shear number. There is something about viruses that are harmless to bats, and so they carry them, that are deadly to humans. This is still an open scientific question. Quammen goes through the basics of disease science: how scientists model disease spread, how we characterize diseases, and how we use that information to trace the origins of the disease. He provides numerous examples of how we have been able to isolate the nature of the specific virus that is attacking humans and where it might have originated from. AIDS is an interesting example. There are lots of internet rumors and stories about where AIDS started. However, I have to be honest: I have never heard about the current best theory. My knowledge is clouded by the false information or earlier false leads and the current best hypothesis never made it to me. For those who are interested, it seems that the best hypothesis now is that an African hunter likely killed an infected chimp, for meat, way back in the early 1900s, maybe about 1908, way before we first identified the disease in humans. That is, it has been circulating in humans for the better part of at least 50 years before we even realized what was going on. There are also interesting dynamics between the different levels of animals involved in the spread of disease. Take ticks and Lyme disease as an example. Ticks catch the disease from mammals, most often small rodents, who then pass it on to the next generation of ticks. That is, ticks aren’t born with the disease, they catch it from other animals. As one scientist quoted by Quammen says, “If mammals didn’t make ticks sick, ticks wouldn’t make mammals sick.” Further, the relationship to the animals we might interact with, in this case the deer, is not so obvious. It was thought that culling the deer would make the disease go away. It didn’t. It made it worse, in fact. This is still being studied, but it seems that the more we disrupt the native animal population, the more we increase the risk of spreading these diseases.